Reading with your children is a wonderful and fun way to build language skills, and holds countless other benefits as well. Many parents raising bilingual kids wonder what type of children’s books are best for learning the minority language. There are three broad categories of such children’s books: books written originally in the minority language, translations into the minority language, and bilingual books (sometimes called dual language books) written in two languages. Each type of book has its place, is useful in its own way, and would make a good addition to a child’s home library. Minority language books can play a key role in language learning. Benefits: Books originally written in the target language are great! If you are able to read a text in its original language, every bit of nuance and wordplay is available to you, and without a doubt, there are some books and poems that are inimitably wonderful in their original form. Look no further than “Jabberwocky,” a poem first written in English whose gloriously unique nature can be hard to replicate perfectly in translation (though not for want of trying, and some of the efforts get quite close to the feel of the original.) Being able to appreciate the wordplay in a piece of writing that’s uniquely accessible to a speaker of its original language can help foster a positive attitude toward the minority language, because it’s like having access to a cool secret code. Another benefit is that reading books originally written in the minority language is an immersive experience in language and culture, which supports biculturalism as well. Keep an eye out for: Poems and nursery rhymes are especially wonderful in the original language because the original rhyme structures are preserved. Benefits: It can be very motivating for a child to read a translation of a book they’re already excited about. For example, if a child loves Eric Carle, Dr. Suess, or Harry Potter, reading translations of their favorites into the minority language can be fun. Also, reading a translation of a beloved book means the characters and plot are already familiar, so the focus of the book can be on the meaning of the language. Keep an eye out for: First, make sure that the quality of the translation is good, i.e. that the book makes sense and the word choice and grammar are correct. It can be helpful to browse through books at the library and use the “look inside” feature of book-selling websites before you decide to buy a book. If you are not a native speaker of the minority language yourself, ask someone who is a native speaker to help you with this task–or just bring them along with you to the bookstore! If you go to a brick-and-mortar store, be sure to call ahead and check whether they have a selection of children’s book in the language you are looking for. Yet there are many timeless stories that touch upon themes that are universal to the human condition. These books are translated into languages across the globe, and that does not detract from their value. Well-translated books are an asset to your book collection. Note that sometimes books written in two languages are called bilingual books, and sometimes they’re called dual language books. So, one tip for looking for books online is that you can increase your search results by trying both search terms plus your language. You will often come up with different search results for each. Benefits: Getting a dual language book is like getting two books in one. If a bilingual child has important people in their life who speak only one of their two languages, either can read this book to the child. Seeing the text of both languages side-by-side can help children develop metalinguistic skills. It allows children to do a side-by-side comparison of the two languages and think about language on a higher level, including considering how and when language is used and the different components that comprise each language. Discussing a dual language book in each language at different times can create an opportunity to introduce vocabulary that involves analyzing stories, which can deepen the child’s comprehension of the texts and nurture their ability to discuss complex topics in each of their two languages. For those children who are learning a heritage language, seeing representations that reflect their at-home heritage can be have a positive impact across dimensions, including academic, social, and emotional. Keep an eye out for: Generally, it may be helpful to read the book all the way through in one language at a time in order to create a language immersion experience (although it does no harm to go back and forth between the languages). This is especially true to if you are trying to create an association of a particular person with a particular language (as in the “One Parent One Language” method of teaching language.) This is similar to the principles behind why there is no need to use simultaneous verbal translation as a teaching method. Where can you find books in the minority language? Your local library is often a great place to start looking for children’s books in your minority language. Check your library’s online card catalogue. If there are few choices in the language you’d like, look into whether your library is able to special order a book for you from another branch. Call local book stores, including used book stores, and check to see if they have a selection of children’s book in your target language. When looking at online book sellers, look beyond big-name websites to niche websites that specifically specialize in selling books in your target language. 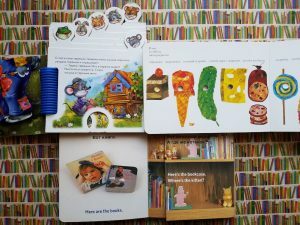 Another unique idea is to get your child personalized bilingual books in your minority language. These can make for interesting, fun, custom gifts. The bottom line is that reading is beneficial to language learning and helps set your children up for academic success. Whether that involves immersion in the language and culture that the book was originally written in, or reading already-familiar plots and characters in a minority language, or even reading a book in two languages, it’s all good. Just… read!